5:37 PM (Texas time) We had a good check-up/visit with Sophie's doctors today. Sophie was disappointed this morning that she would not get to run in the sprinkler with Elisabeth (who was going over to a church-member's house while we went to Lubbock). In fact, I think Sophie is still a little miffed. The latest news from Sophie is that she decided today that she really did not want to use the numbing cream on her hands prior to getting "poked." It was her idea, and Susan and I were quite surprised that she came up with it. We tried to convince her that the cream helps with the poke, but she would not be swayed. When we got in to see the nurse, she was very, very quick with the blood draw (I called her "quick draw") and while Sophie cried and was very upset, it went well with only one "poke." Sophie later told the nurse that she did not go slow the way Sophie prefers, to which the nurse replied (sweetly), "Well, next time, you'll have to remind me of that when I see you!" It was a much better visit than last time even, and although I can't speak for Susan, I felt a lot better about the doctor's rapport with Sophie. It probably helped that she had a cheerful, friendly student doctor trailing her. Sophie's counts came back great, so her immune system is building back up. Her platelets were a little low, but nothing to worry about and nothing really unusual. She's not been bruising or anything, so we'll just note that and keep moving forward. Sophie will finish up her antibiotics in December, which just feels like an eternity away, but will be here before we even know it. Things are otherwise going well around here. Both girls went to a Cheer Camp at the high school for a few days this week and both girls started their ballet classes this week. School starts in a couple of weeks, so our lives will suddenly have a predictable rhythm--I, for one, am looking really forward to that! 10:29 (Texas time) Not a whole lot to report. 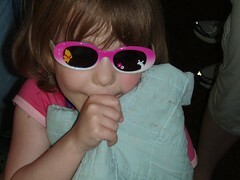 Sophie's been doing well, although she complains of headaches now and again and is easy to have an upset stomach. It may just be a phase, though, who knows. I've been a "single parent" most of this week, as Susan has had a meeting back in North Carolina. 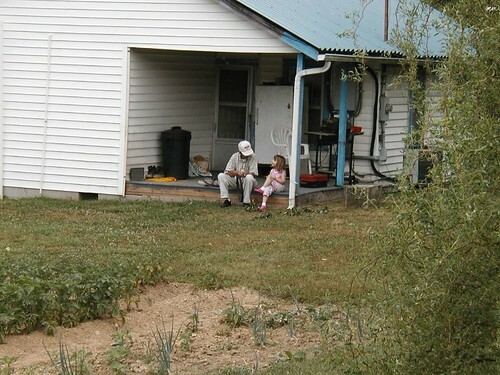 I know it will disappoint some of our friends back there to know that she will not be able to visit on this trip--she is, however, going up to see her mom for a couple of days at the tail end of that trip. For the most part, the girls have behaved themselves. We went to the Curry County (Clovis, NM) Fair last night with friends from church and the girls got to see their first Demolition Derby. I'm not sure they were impressed ("just a bunch of people crashing cars" was how one of them described it). School starts in a week and a half, so summer is all but gone. As I mentioned earlier, I'm looking forward to a "routine," even if that routine is crazy. It seems as if with school looming on the horizon, all kinds of things are picking up at church, which will make things interesting! 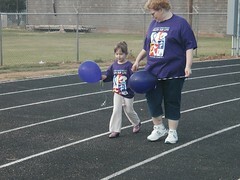 This is Sophie walking the Survivor's Lap at the Parmer County Relay for Life event. It was an emotional time for Susan and me. Sophie's last trip to the UNC Children's Oncology Clinic (for sedation, spinal tap, and an injection of methotrexate in her spinal fluid). She's just waking up here from sedation and enjoying a double batch of cheese grits (of course). 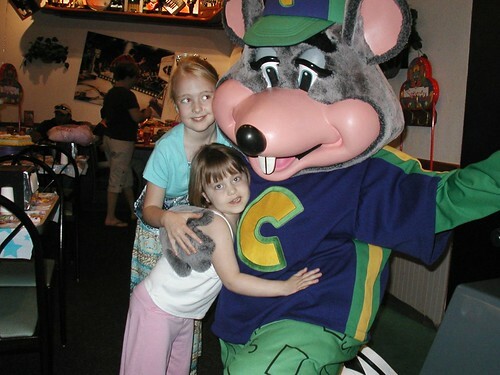 Elisabeth and Sophie with Chuck (E. Cheese) at Sophie's birthday party in May. 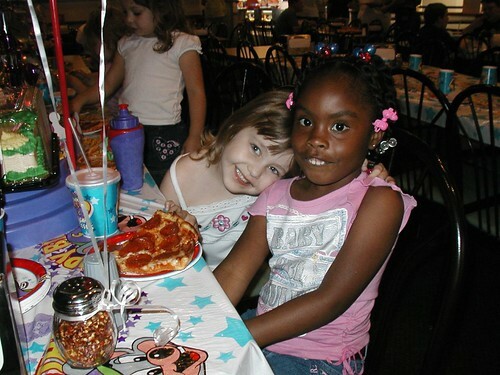 Sophie with her very, very best friend, Tamar, at her birthday party. Sophie misses Tamar very much and talks about her often. I'll never forget when Tamar first started going to day care with Sophie how the two of them hit it off right away. Then, if Tamar got picked up early, Sophie would cry and cry and cry. Then again, if Sophie got picked up early, Tamar would cry and cry and cry. 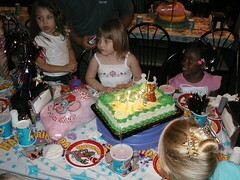 Elisabeth, growing up too fast, at Sophie's birthday party. 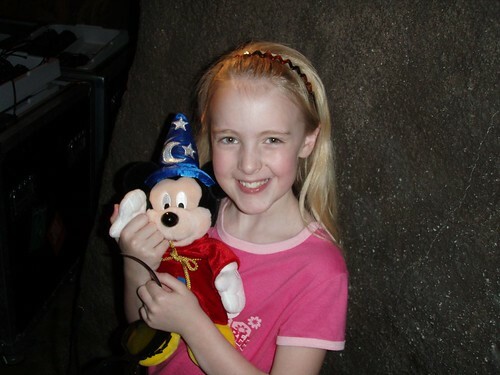 Elisabeth, on our visit to Walt Disney World this spring. Sophie, being the TOTAL NUT she is! Sophie, with her ever-present blankie. 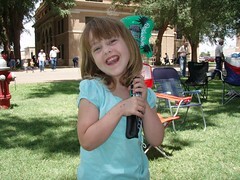 Sophie, showing off the prize she won at Border Town Days here in Farwell (that's the Parmer County Courthouse in the background). 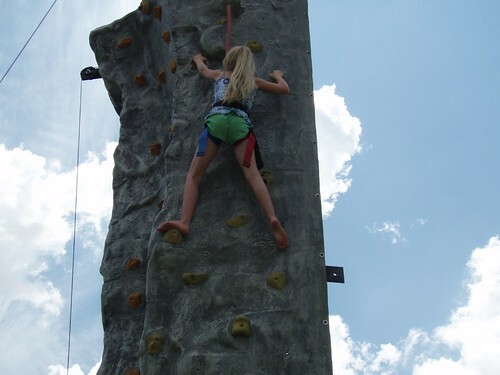 Elisabeth, fearless as always, climbing the rock wall at Border Town Days. Well, that should be enough pictures for you, I hope! If not, feel free to check out Flickr--there are plenty more (and yes, mom, you can order prints!). 8:00 Central time: Before dance class last night, we took the girls to get their hair cut. Elisabeth got about 8 inches cut off, maybe more (I'm not good with lengths). She had been growing her bangs out for a long time, and now she has this really cute bob and all her hair is the same length. It's still just as blond as can be, and the cut makes it look so thick and swingy. She's really proud of it and was smiling all night. What we haven't mentioned here is that Elisabeth got her ears pierced when Randall's sister was here visiting a few weeks ago (what a wonderful visit that was--we want her to come back as often as possible, now that we're fellow Texans). Anyhow, Elisabeth is proud of her earrings, and she asked us last night which we liked better--her hair or her ears. We all agreed (her included) that her hair is the most impressive, but you can tell that she's very proud of both. Sophie got her hair cut too--her first cut since it grew back in, and it was a little emotional for us, because that hair means so much. It's nearly as long as it was when she was diagnosed. As soon as she started chemo, it got thin, but it didn't all fall out. When it really started to get thin that first April (2005), I cut it into a little bob, just so it didn't look so stringy (see this picture). 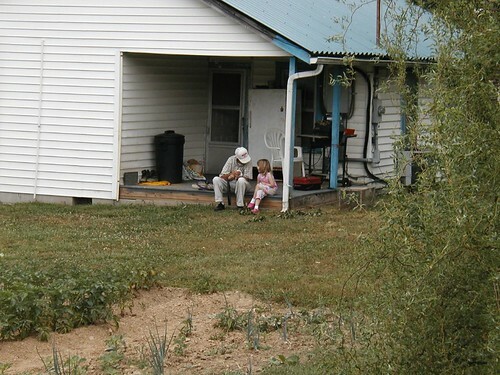 Then during the intensive part of her chemo in August and September of 2005 it all fell out (see this picture). Her hair has been beautiful as it grew back in. It was so cute when it was short, and then as it got longer, it was a little wavy at the ends and does this cute little flip. Well now, it's past her shoulders, but it had gotten uneven and just looked kind of messy all the time. We explained the situation to the hairdresser, and he cut as little as possible just to even it out. He did a great job--it's not as dramatic as Elisabeth's, but it looks neat and nice. We'll try to get pictures of both girls posted soon. 3:30 PM (Central time): The girls are back in school, and they are thrilled. I don't know who is happier about it--them or us! They had their first day yesterday, and we got up bright and early, took lots of pictures, and walked them to school. 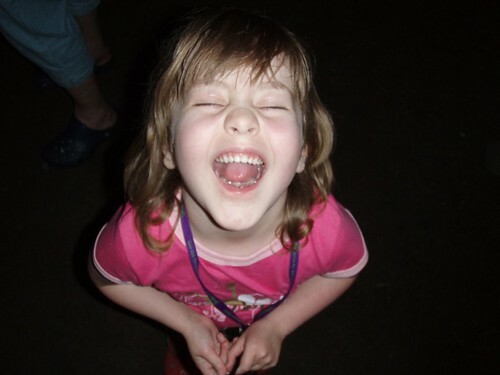 Although some kids in Sophie's class were a little uncertain (or even crying) about being left, Sophie did just fine. I think her time at Countryside really helped her transition to kindergarten. 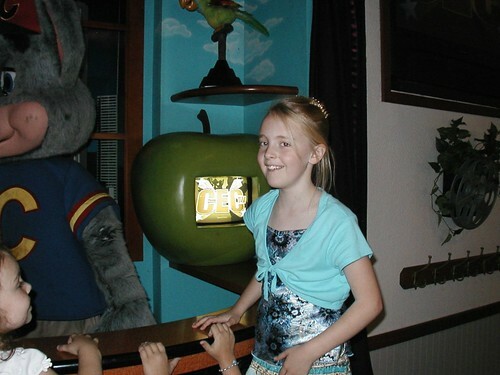 I can't believe Sophie is actually in school already! This morning, the girls weren't nearly as excited about getting up. We wake them up at around 6:45, and I think they would prefer to sleep until about 9:00. It was raining this morning, so we drove to school. They have both been wanting to walk home (which we just haven't been sure about, even though it's between 2 and 3 blocks away). Randall went to pick them up this afternoon, and they convinced him to let them walk home together, so he drove on ahead of them. They were holding hands most of the way--what sweet girls!